INGOs know that really good, sustainable development is complex. Of course we’d like to be able to explain all the intricacies of the complex work that INGOs do, but the last time I looked not many of the thousands of supporters that donate to CARE International have a masters in international development, and many donors have never been to a developing country. Fundraisers and communicators know that understanding audiences and human behaviour is key to success. We use the principles of persuasion to improve our fundraising and campaigning results. Our communications should be accessible and persuade people to support our cause. Research by Nobel Prize-winning psychologist Daniel Kahneman tells us that our brains are mostly wired to take short cuts with two systems of thinking: fast and slow. Fast is automated and effortless, slow is logical. As a sector, we spend a lot of time in the slow thinking mode and although we might want to think that that system is in charge, the reality is different. A Guardian study found that in a 45-minute journey across London the average person sees 130 brands. Most of them were forgotten. The Direct Marketing Association says a consumer has to be exposed to an advert an average of seven times before they respond, and that on average we have less than two seconds to grab attention. To capture attention we need simple ideas and messaging, but we must also use the science of behaviour. I have a "chefy" friend who cooks incredibly well. It’s a nightmare for me and my one pot cooking style. I can never really repay him, but I like to be consistent in returning the favour. The principles of reciprocity and consistency are demonstrated beautifully with Friends of the Earth’s highly successful bee campaign. 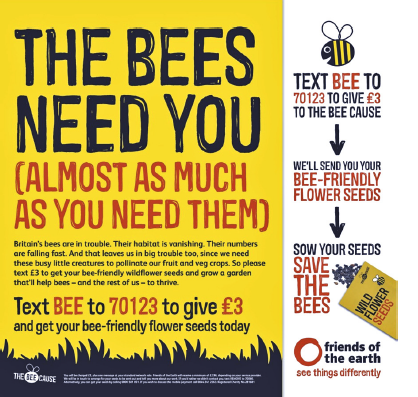 Text to give £3 and they will send you a packet of bee-friendly seeds. People self-identified as being concerned for their environment made a small commitment and they got something in return. The trick to reciprocity is to be the first to give. People also like to be consistent - especially with their values. As responders had made a small commitment, they were far more likely to convert to longer-term support for Friends of the Earth. In 2003 British Airways announced that Concorde would take its last transatlantic flight. The next day sales rocketed. Nothing had changed about this flight – it wouldn’t be going faster, it wasn’t cheaper – but suddenly this opportunity had become scarce and therefore more valuable. People simply hate to lose out. Scarcity value is a powerful convincer. The Big Give do this very well with their matched giving campaigns, which are limited to the match pot - donate now or you’ll miss out! The power of a uniform can generally convince you to conform. If someone looks official then you are likely to respect their authority, which is our next principle. At CARE International we applied for a Christmas newspaper appeal, which involved pitching to their editorial team. We happened to have Angelo, a programme colleague, in town from South Sudan so we took him along to the pitch. Hearing about CARE’s work from Angelo and his experience of the tough conditions our teams work in worked a treat – they were mesmerised by him. We won the pitch and raised over £200K through the appeal. Lesson here – use your experts! Principle 5: Are we all sheep? Short answer - yes. How many times have you googled reviews to find out what others think of a product or checked out TripAdvisor before booking a holiday? Which brings us to the next principle – consensus. 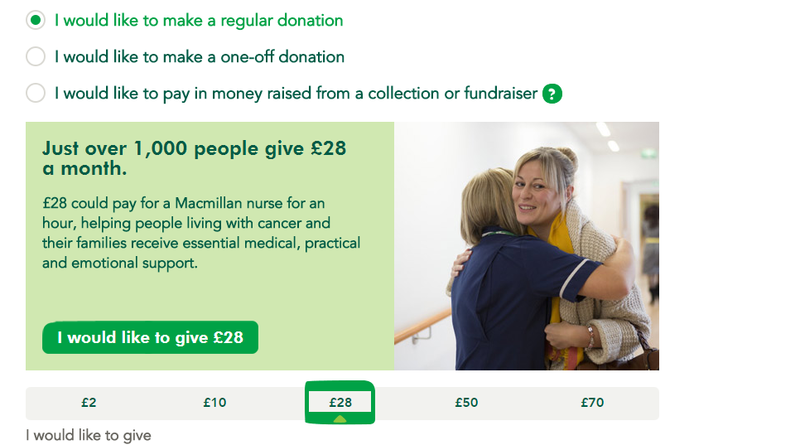 Here is a lovely example from MacMillan Cancer Support who are using this principle in an excellent manner. Other people are giving £28 per month, I want to be like them. The next principle is liking – people relate to people they like, who share their values and who pay them compliments. Corporate fundraisers are really good at this: they place themselves in the same circles as their potential partners: they attend their events, have a genuine interest in what they are doing, and then reference them back. For example: “I read your report on supply chain sustainability, I found it fascinating and thought about how this complements some of the work we are doing in Vietnam with a snacking company” says I’m interested in what you have to say, I like what you are doing, I’m doing the same thing and we could work together well. Bingo, you are in. Robert Cialdini recently added a seventh principle: unity. It’s one we are seeing an uprising of with increases in demonstrations and more people signing petitions. The CAF UK Giving Report for 2017 also shows some interesting research around this. The "Stop funding hate" campaign knows its audience and what they want: for newspapers to cut out the hate speech and to report more accurately and fairly. Their objective is to make hate unprofitable. Recently they released a film which put the individual at the centre of the stories and replaced named groups with "People like you". The principle of unity shines through. The organisation is seeking funds to expand their work, and this campaign placed individuals in the shoes of others. Super effective in invoking empathy.